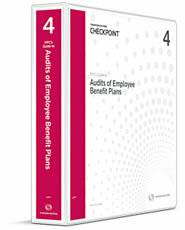 Audits of employee benefit plans differ significantly from audits of other types of entities. These audits are not only subject to peer review but are also subject to inspection by the Department of Labor (DOL), so it is important that you conduct them in accordance with generally accepted audit standards and DOL rules and regulations. The Guide is authored by internal and external industry experts, and when necessary, our authors consult with representatives of the DOL to ensure our tools address their requirements.